Heat oven to 300°F. Grease 9-inch springform pan, and line the bottom with a circle of cooking parchment paper. Meanwhile, increase oven temperature to 350°F (325°F for dark or nonstick pans). Generously spray bottoms and sides of two 9-inch round cake pans with baking spray with flour. In large bowl, beat Maple Cake ingredients with electric mixer on medium-high speed until well combined. Pour into pans. Bake 20 to 25 minutes or until toothpick inserted in center comes out clean. Cool in pans 10 minutes, then turn out on cooling racks to cool completely, about 1 hour. 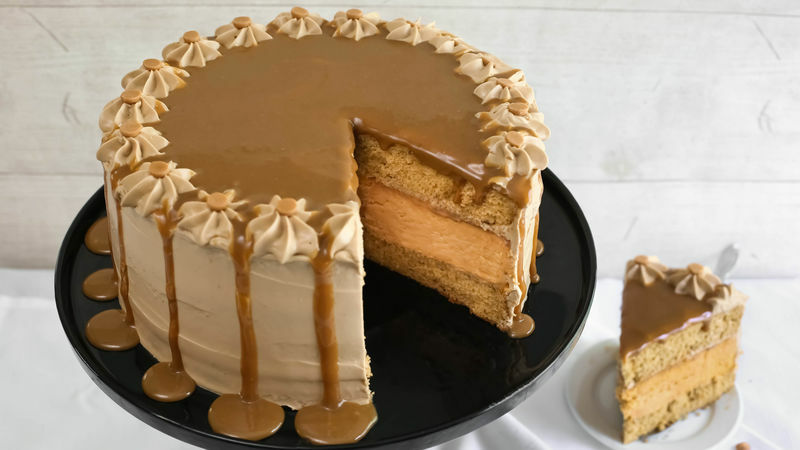 In 1-quart saucepan, heat Butterscotch-Maple Drizzle ingredients over medium-high heat until melted and mixture can be stirred smooth with whisk. Let cool until barely warm but still pourable. Drizzle mixture over cake. Place 1 butterscotch chip upside down into each piped star to garnish.